Fabulous thank you gift for your Teacher or Teacher assistant at the end of the school term! 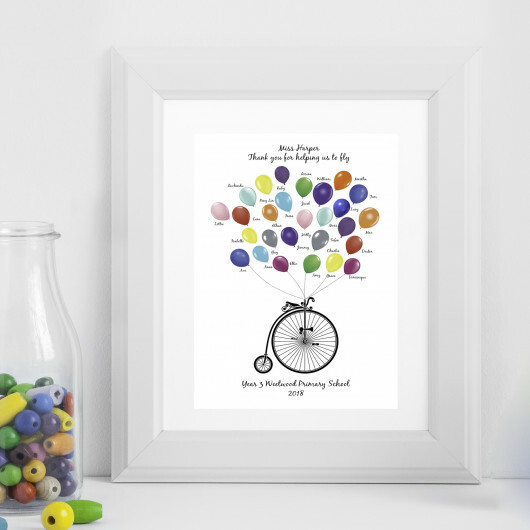 This lovely print, is stunning and makes a lovely keepsake for any teacher. It features a different balloon for each child in the class with the child's name. The balloons are then designed to fly above the bike and will be ordered whichever way look sbest, depending on the numbe of children in the class. This can also be done as an individual present to a teacher, which you can see from the images. The print can then be personalised further with the teacher's name and then the message "Thank you for teaching us to fly" is standard. Underneath the Penny Farthing the school, class and date can be included. As standard the print comes unframed A4 however you can choose this to be upgraded to a Black or White framed print which measures 30 x 40cm. Please Note the frame has an acrylic front as apposed to glass for safety purposes.